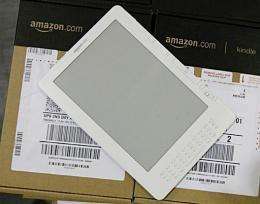 Amazon's new Kindle DX is ready for shipment at the warehouse in June 2009. Amazon.com has settled a lawsuit that sprang from a Big Brother-like move of deleting books by George Orwell from its Kindle electronic readers as a quick fix for copyright concerns. Amazon.com has settled a lawsuit that sprang from a Big Brother-like move of deleting books by George Orwell from its Kindle electronic readers as a quick fix for copyright concerns. The negotiated settlement on Thursday was awaiting the approval of a US District Court judge in Seattle, Washington, where Amazon has its headquarters. Amazon agreed to pay 150,000 dollars to lawyers representing a US high school student whose copy of Orwell's "1984" was zapped from his Kindle and promised not to unilaterally yank ebooks from Kindles in the future. A portion of the money paid by Amazon is to be donated to a charity that promotes literacy, education, health, children's issues, or job placement. A copy of the settlement paperwork available online did not specify how much, if any, of the money would go to the duo named as plaintiffs in the suit. Amazon deleted Orwell ebooks from fewer than 2,000 Kindles, according to settlement documents. "With an uncanny knack for irony, Amazon recently remotely deleted any traces of certain electronic copies of George Orwell's '1984' and 'Animal Farm' from customers' Kindles and iPhones, thereby sending these books down Orwell's so-called 'memory hole,'" the lawsuit said. Justin Gawronski, the Michigan high school student that brought the suit along with another Kindle user, had made "copious notes" on the version of "1984" he was reading as a summer homework assignment, the suit said. "After Amazon remotely deleted '1984,' those notes were rendered useless because they no longer referenced the relevant parts of the book," it said. Under the terms of the settlement, Gawronski or others that had ebooks deleted will be able to get back those versions complete with any digital notes they may have made in them. The suit claimed Amazon had not disclosed to Kindle users previously that it had the ability to remotely delete content and asks the court to prevent the online retail giant from doing so in the future. "Amazon has no more right to delete e-books from consumers' Kindles and iPhones than it does to retrieve from its customers' homes paper books it sells and ships to consumers," it said. Amazon founder and chief executive Jeff Bezos has apologized for remotely deleting the Orwell books, which had not been authorized for sale by the publisher. "Our 'solution' to the problem was stupid, thoughtless, and painfully out of line with our principles," Bezos said. "It is wholly self-inflicted, and we deserve the criticism we've received." Amazon refunded the purchase price of the books to Kindle users.